Royal Limousine is proud to provide limo rental, party bus rental, executive sedan rental, and more to the entire Detroit area, including Detroit, Arbor, Livonia, Canton, Westland, Plymouth, and the surrounding areas. We specialize in all aspects of luxury transportation and strive to deliver the highest quality of service to all of our customers. Our new model limousines are guaranteed to satisfy any occasion. We offer competitive rates on all of our limo services, including your wedding day needs, hourly limo rentals, and airport transportation. Our fleet includes a wide selection of custom limousines, corporate sedans, and party bus limos to fit any style. 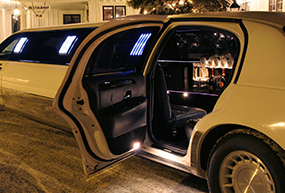 Whether you are renting for a bachelorette party of a corporate event, we can create a limo package to suit your needs. Contact us today to book! This trip is accepted with the condition that the performance of the service is subject to the carrier’s tariff rules and regulation, as well as Royal Limousine’s ability to furnish the equipment and perform the service. Positively NO REFUNDS on deposits and/or payments made in full. Cancellation for limos is to be 30 days in advance or subject to full charge or a minimum of 20% cancellation fee. Airport service cancellation is to be 24 hours in advance or subject to full charge. Any time prior to 24 hours cancellation is 20% of reservation. The chauffeur inspects limousine and motor coaches before and after every run. Client hereby agrees immediately upon demand to reimburse Royal Limousine in full for any and all damages and injuries to any company agent or employee or to any vehicle including but not limited to; abnormal cleaning, cigarette burns, and other interior and exterior damages, with a minimum of $500.00 or actual cost of damages. I give Royal Limousine Service permission to charge full cost of damages to my credit card. There is NO SMOKING in Royal Limousine Vehicles. I hereby acknowledge that the chauffeur has advised me that the limo is a non-smoking limo. Failure to obey these rules resulting in a cigarette, cigar or pipe burn will result in charges to the customer for full damages. Client assumes full responsibility for themselves and their guests in regards to consumption of alcoholic beverages and/or food. Use of narcotics and controlled substance is strictly prohibited. No alcoholic beverage shall be served to persons less than 21 years of age. Vomiting in vehicles results in a $250.00 clean up fee. Client is responsible for all tolls and parking, if any. Customer hereby waives any and all claims against Royal Limousine Service, any agent, or employee or company for injury, loss or damages, including consequential damages, to customer’s persons or property from whatever cause and however occurring, unless the same shall be caused by the gross negligence, or willful misconduct of Royal Limousine or it’s agents or employees. In case of unexpected breakdown, accident, severe weather conditions, or anything that cause delay or arrival; I the undersigned shall take no recourse. Royal Limousine Service is not responsible for articles left in the vehicles. Royal Limousine retains the right to void this contract. Client will be held responsible for any and all costs, including but not limited to collection fees and/or attorney’s fees. Client agrees to pay the total amount the vehicles were contracted for, even if Client dismisses the vehicle early. By signing the bottom, I agree to the terms & conditions of this agreement. I agree / authorize that Royal Limousine charge my card on file for a deposit or any item if breach of contract. By giving my credit card information, I verbally authorize Royal Limousine Service (RLS) to charge my credit card based on contract terms and conditions. By replying via E-mail or Fax, you agree to all terms and conditions and will be fully responsible for booking information. Experience the finest in Detroit Limousine and Detroit Airport Transportation with our new vehicles, certified chauffeurs, and guaranteed on time service. As a full-service limousine company, we are proud to serve the entire Detroit Metropolitan and Windsor area.